Congratulations to Steve who shed his beer gut and packed on some muscle in time for the beach in record time. Steve starting out with a 24 pound extra passenger. Not the tight back muscles. 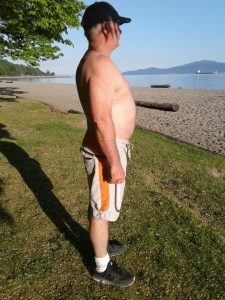 Steve, a 60 year old, farmer and bee keeper, started out with a keg-sized beer gut, slouching posture, unable to touch his toes and would get winded after a few squats and push ups. Worse, his body fat and blood pressure were at unhealthy levels. Steve’s gut was actually obstructing his view of his feet. 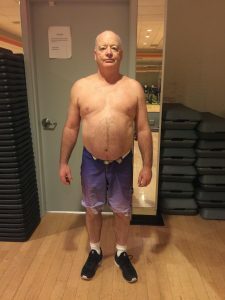 Steve figured on doing something about his health and fitness situation and hired me on to train him. Even with short lay-offs due to work and illness, Steve persisted with his training. Some days were easier than others, but we made each session count. That beer gut had to go. We stuck mostly to standing free weights (cleans and presses), full-range bodyweight and breathing exercises and stretching. 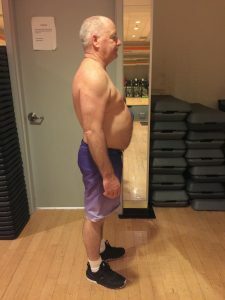 Steve reported a “definite shift” in his abdominal area. Where it was originally a bloated mass of flesh, his stomach became more of a wall flexible muscle. This meant that Steve could bend and twist at the waist. Steve at the beach in June. 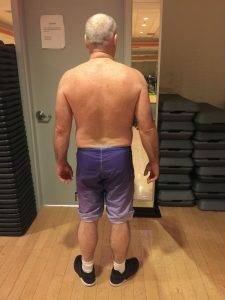 He has less of a gut, better posture, shoulders more aligned. Most important, Steve was able to move more freely and not struggle to get up from a sitting or prone position. Beer gut almost gone. Actual ribs showing. Muscle definition showing in the triceps. Note the “V” shaped back, with muscle definition, wider shoulders and narrower waist.